You may ask why buy a wine cooler and question don’t I have a fridge for that ? Well, wine coolers do exactly what they say on the tin and that is cool wine. They are designed purely to do this, they are made to chill your wine to the perfect temperature which is ideal for serving white and Rose wine and some models even allow for dual cooling for red and white wine. Many wine coolers allow for the temperature to be adjusted to your preference for chilling wine. In fact some models even have dual modes which allow for wine to be chilled at a different temperature at the same time. This is perfect for a party or entertaining when you want to serve both white and red wine as dual models allows for 45 f for whites and 65 f for red at the same time. But what about sparkling wine? Well some models can also chill wine to the low temperature of 40 to 43 f which many people like for drinking sparkling wine. Now that you have decided that a wine coolers is an essential addition to you kitchen you need to know what to look for when finding a great cooler. Decide what wine you want to chill: This allows you to look for a basic cooler or a dual. Decide on what size will work in your space and also make sure you look for a cooler that has the capacity to chill ALL of that delicious wine. You have decided on the size and style of the cooler but need to choose which one you would like to have to complete your kitchen. When comparing wine coolers we would think of the following. Depending on the age and price of your wine you may want specific features such as light protected doors these would protect your wine from light and would work perfectly for you to preserve your wine in the best condition possible. As you can see there is lots to take into consideration when choosing a cooler but we also hope that you have decided that a wine cooler will be the perfect addition to you kitchen. Happy cooler hunting. Colour theory is a favourite topic of ours at Silke, entirely because of the flexibility and subjectivity of it. Colours, specifically how they are used, both individually and in tandem, makes for a fascinating topic of discussion within a design context, and it’s definitely something that people with a design project in mind need to take into consideration. Thankfully, we pride ourselves on being as helpful as we can in as many was as possible, however niche the topic, so today we’d like to return to the topic by focusing on one specific colour; Cream. Cream’s a bit of an interesting colour for several reasons; firstly, despite it’s closeness to white, it evokes a totally different feeling for most folk. White, by virtue of being a neutral shade more then a definite tone, has a very sterile, clean, and efficient sort of ambience in most contexts. This is particularly notable when it’s paired off with other neutral shades like Black and Grey, which it often is in modern kitchen design. Cream, conversely, has a slightly warmer, more homely feel; though still relatively neutral, it has a level of tonality to it that’s in the brighter regions, meaning it picks up and reflects light very easily. The tone itself is very warm and inviting, which only adds to the homely effect it imparts on a people when heavily used in room design. It’s likely why it’s found in very sterile environments fairly often- Doctor’s offices, hospital waiting rooms, office blocks etc. Despite having a hint of tonality, it nonetheless remains a very flexible colour to use in design settings. Most colours and shades will work with it fairly well, whether it’s the dominant colour or not, without diminishing it’s homely effect. This also makes it a very flexible shade when it comes to aesthetics; though it’s typically associated with kitchens that utilise older or more retro forms of design, cream can work with more or less any design ethic you can think of. In fact, if we can drop impartiality for a second, we think it makes a quite daring companion to modern kitchen design, in lieu of White or lighter shades of Grey. It compliments and contrasts Black and Metallic surfaces perfectly, whilst allowing for a more welcoming and inviting atmosphere overall. 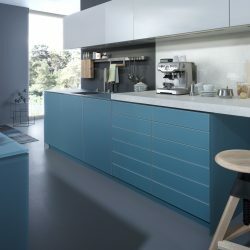 If you’re looking for an ultra modern, cutting edge kitchen with a somewhat friendlier touch, then Cream is a colour you definitely ought to consider. As always, we are happy to give further consultation regarding Colour and design choices before you commit to anything, so if you have any further questions, please feel free to contact us directly. We offer a wide range of colours provided by only the best paint specialists in the country, so no matter what your taste, you know you’re getting the best!